Is there a workaround for the removal of “Copy Path” in pcmanfm-qt? Briefly, now that the Copy Path option has been removed from the lxqt version of the pcmanfm file maanger, I'm trying to find a workaround. More details: I've been using Linux since 2015, solely using Lubuntu and pcmanfm, so maybe I haven't learned the right way to do things. But whenever I've needed the file/path name to insert into a desktop file, bash script, or command line, I've always used the "Copy Path" option under the context menu of pcmanfm. Now that it's gone in the lxqt version (and I'm preparing to move to that version eventually), I'm trying to find a workaround for that missing function. Aside from solely using the CLI for navigation (if I did that, why would I need a file manager?! ), what are the easy ways to get the path/file name without having to do a complex series of actions which I now have to do sans Copy Path. There's got to be a better way and there likely is. I just don't know what it is! Thanks. 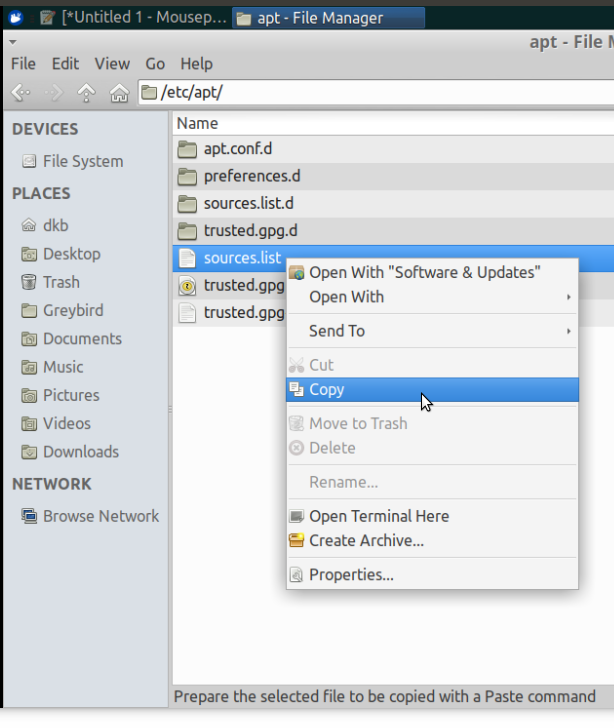 The Copy Path feature provided the ability to right-click on a file in the file manager and to choose "Copy Path". This action would copy the path of the file, say, /etc/apt/sources.list, into the clipboard for pasting elsewhere. This feature is present in the the gtk version of pcmanfm but not in the qt version. Other file managers such as thunar and nautilus provide this feature without explicitly naming it "Copy Path". See my answer below. Thanks for the ideas. I've tried all of them, xc for Thunar, which I have yet to download (but I have tried before and it's a very nice lightweight fm). But I wanted to tell you guys that I contacted the developers, and Copy Path will be added back to pcmanfm in a later version -- I think they said the next version. Apparently, Copy Path was more popular than they had counted on. So if I can figure out how to tag my own post as the answer I will do so. In the meantime, it's great to have other options. Thanks again for the backup ideas. You can install Thunar in Lubuntu 18.04 and 18.10, as suggested in another answer without having to switch desktop environments. sudo apt install thunar will pull in a few necessary dependencies but not the entire XFCE or Xubuntu desktop. Click on "Copy", open your destination file and paste: the exact path that you'd get with the gtk version of PCManFM is pasted in whether you've opened a text file or a terminal. You don't have to do anything else. In short, if you paste into a document or terminal, the file's path is pasted. If you paste into another window of Thunar itself, the file is pasted (i.e., copied). Alternatively, just install the gtk version of pcmanfm which is still available in 18.10. Not the answer you're looking for? Browse other questions tagged lubuntu pcmanfm lxqt or ask your own question. How can I make PCManFM open plain text files with Leafpad by default in Lubuntu? Are there any SVN plugins for PCManFm? Is there a possibility to export/backup the settings of PCmanFM in Lubuntu?